Galway East Tourism - Athenry Castle in East Galway, West of Ireland.Galway East Tourism - Athenry Castle in East Galway, West of Ireland. This three storey tower built by Meiler de Bermingham c.1250 is surrounded by defensive walls. Recently re-roofed, the interior contains an audio visual room and exhibition, and guided tours are also available. There is access to the ground floor of the castle for visitors with disabilities. 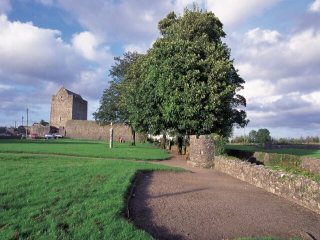 Travel back in time by stepping into this 13th century castle in one of the most notable medieval walled towns in Ireland. Once the home of a Norman warlord; now beatifully restored, giving the visitor the opportunity to explore what life was like centuries ago. As well as exploring the castle, a film and guided tour bring the place to life. The great three story tower, surrounded by defensive walls, is entered at first floor level through an unusual decorated doorway. There is access to the ground floor for people with disabilities.